Barrio Writers is a free, week long, college level writing workshop that is specifically geared towards youth in underserved communities. The program came to my attention through the direction of my colleague, Patricia Valdovinos, our former Outreach Services Librarian. 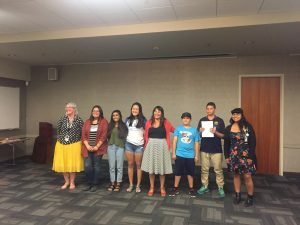 She mentioned that she knew of a cool program an author friend of hers had started down in Santa Ana; I looked into it (you can too, https://www.barriowriters.org/), and knew almost immediately that we needed to bring the program to our youth. Vaile Fujikawa (L) and Patricia Valdovinos (R) celebrate with Sarah Rafael Garcia (lower left) after the completion of the 2017 Yolo Barrio Writers. While I did my fair share of helping Yolo Barrio Writer’s grow and thrive that first year, I need to make clear that it was not my brain child. Patricia, now a Bilingual Outreach YA Librarian at Los Angeles Public Library, was the driving force behind the project, she asked if I wanted to collaborate on bringing it to Yolo County, and I hopped on board. That first year in particular my roll, as someone who had been in the system a little bit longer, was mostly to help facilitate the program’s success by navigating a lot of the bureaucratic red tape, but without Patricia, it would have never made it off the ground. It was Patricia’s project, I was there to make sure everyone was fed, paid, and had the materials that they needed for success. The first year I spent more time in the kitchen than the writing room, and did not see the majority of our youth’s work until the last day. What appealed to me about Barrio Writers was giving young people an opportunity to not only develop and empower themselves and each other, but also Sarah’s dedication to ensuring that the youth, most often youth of color, saw themselves in the work– in the artists that she chose for us to read and listen to. Furthermore, Barrio Writers is very much about promoting community and cross-cultural awareness. I wanted to blur the lines that divide us, as much as we could, to create a safe space for our youth to explore and ask questions. In the first year our Barrio Writers came from three different service areas: the Davis Migrant Center in Dixon, the Mary L. Stephens Branch Library in Davis, and the Arthur F. Turner Library in West Sacramento. For 2018 we wanted more: more kids from the Migrant Center, more kids from Davis, more kids from West Sac, and more authors. We hosted four different authors, including Sarah, in three different locations: the two libraries and the Migrant Center. Maria Sandoval (left) Katrina Laws-Ewald (center) and Vaile Fujikawa (right), 2018 Barrio Writers writing advisors. This year, things were quite different. There were some small changes: I switched branches (within the system) so we were able to more effectively open the program to more youth than the year before. 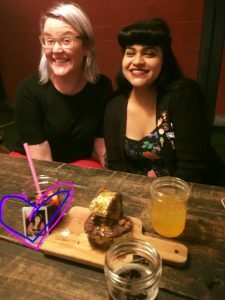 Indeed, we went from 6 Barrio Writers in 2017 to 20 in 2018, more than tripling our registration– a Barrio Writer’s first. 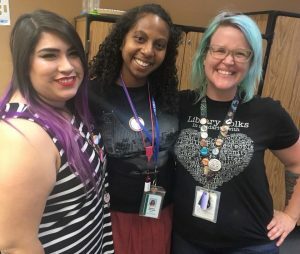 We also brought in more staff– the new Youth Services Librarian for the Davis Branch, Katrina Laws-Ewald, and Library Associate, Maria Sandoval. The biggest change of all, of course, was that Patricia was no longer with Yolo County– she took the position in Los Angeles, and while she of course worked diligently right up to her last day (and beyond), her absence was sorely felt. We had a major goal this year as well, to learn everything we possibly could from Sarah Rafael Garcia, so that we could run the program in house in 2019. 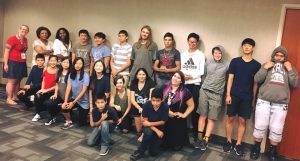 Our other goals remained the same– building community, exposing youth to local authors, and all of the skills that accompany college level creative writing. The things that came naturally to us in 2017, the sense of community that we built in our small group of 6 youth, were more elusive this year. Harnessing the attention and engagement of a group of 20+ teens is no small feat– let alone for 3 hours a day, 5 days straight. The youth got there, eventually, but it took all week, and even so there were still moments of tension that I wish I had handled differently. In the first year we spent 3 days at the Migrant Center, and it opened up opportunities for youth to learn a lot from the children of the farm workers who live there from April to October every year. This year we only spent 1 day at the Migrant Center, and we never had a discussion about what the Migrant Center was, or who lives there and why, until about 10:00 p.m. on the last day. It remains my biggest regret over the course of the week. Looking ahead, I am left with more questions than I have answers. We want to continue to extend the program, to include more rural branches, but also to preserve the integrity of the group and to continue to ensure that we are building safe spaces for all of our youth, no matter their background. How do we do that while also expanding our services beyond what we already are offering? We have a lot of ideas, a Spring session and a Fall session; congruent workshops across the system, and so on, but I can’t see any of it too clearly at this point. What I do know is that I must move forward with intention; that building community is not an accident, it takes strength and patience and learning; and above all else, we must listen to our youth and use our privilege to leverage more for those that need it most. 2018 Barrio Writers and writing mentors at the Mary L. Stephens Branch in Davis, CA. Vaile Fujikawa has been working in libraries since 2009, and as a librarian with her current system since 2015. She is passionate about service to the people, and strives always to do a better job than the day before. When she’s not at work you can might find her in the garden; or her home gym; but most likely she’ll be snuggled into the couch, reading a murder mystery, with her family and five pets (it’s a pretty big couch).